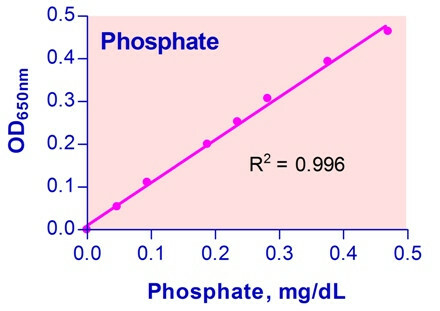 Phosphate (Pi) is one of the most important ion species in nature. Phosphate is present in all biological systems. It is a major constituent in minerals and fertilizers, and is a component of industrial wastewater. Thus accurate determination of phosphate concentration finds numerous applications in pharmacology, biomedical research, clinical chemistry, industrial process monitoring and environmental monitoring. Simple, direct and automation-ready procedures for measuring phosphate concentration in biological and environmental samples are becoming popular. BioAssay Systems’ phosphate assay kit is designed to measure phosphate ion directly in samples without any pretreatment. The improved Malachite Green method utilizes the malachite green dye and molybdate, which forms a stable colored complex specifically with inorganic phosphate. The intensity of the color, measured at 620nm, is directly proportional to the phosphate concentration in the sample. The optimized formulation substantially reduces interference by substances in the raw samples. Applications For quantitative determination of phosphate and evaluation of drug effects on phosphate metabolism. References Assay: Phosphate in Rat bone (Pubmed).